For the vast majority of Mac users, macOS Sierra is a nice upgrade that goes without a hitch. For a small number of users, macOS Sierra presents a unique variety of problems that are impervious to all troubleshooting attempts, even reinstalling Sierra or a clean install. 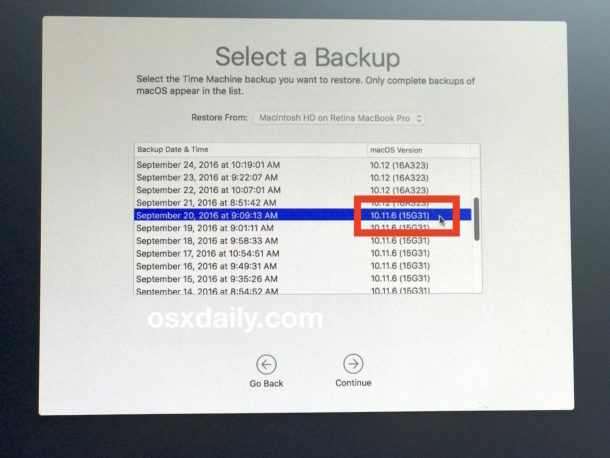 If you fall into the latter camp, or just decide that macOS Sierra just isn’t working out for you, you can downgrade from macOS Sierra to OS X El Capitan or Mavericks by using a Time Machine backup made beforehand. 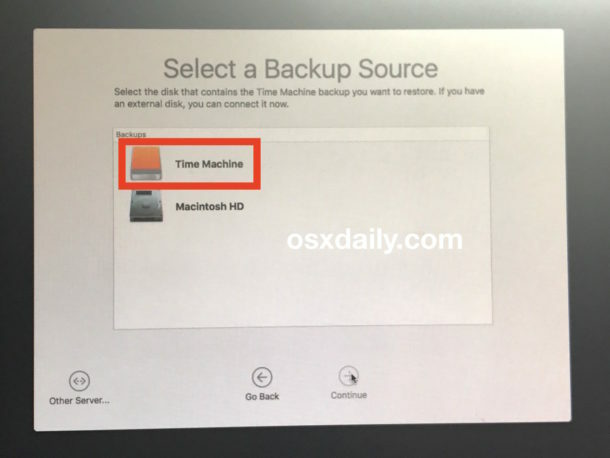 This obviously requires a functioning Time Machine backup to work, one of of many reasons why setting up Time Machine on a sufficiently large external drive is one of the most important maintenance routines you can have on a Mac. The ability to prevent data loss, or roll back problematic software updates or OS upgrades is invaluable. * Remember, a side effect of rolling back with Time Machine is that any interim data will be missing unless you manually back up the files yourself before beginning the process (for example, if you restored from January 1 but it’s now January 15, you would lose files created or modified between those two dates unless you manually back them up before the restore). I personally get around this by creating a folder on the Time Machine volume and manually dragging and dropping important new documents into it, then just copy them back over to the restored Mac, but some users rely on iCloud Drive, DropBox, or other services. If you skip that, you’ll lose the interim data. 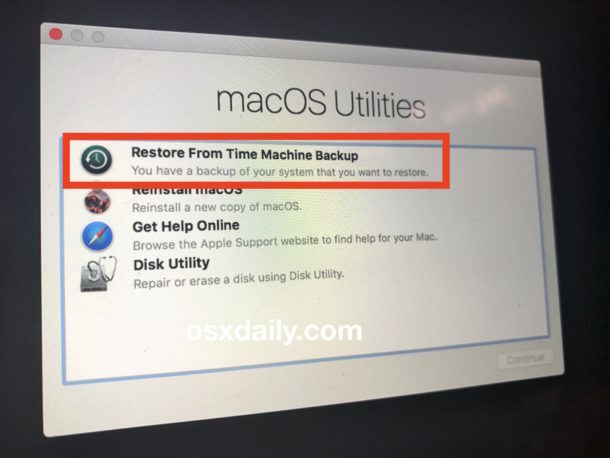 Once the Mac has finished restoring from Time Machine, the prior version of Mac OS will automatically boot with all of the data backed up from that time period. In this example, that means the Mac is now back on MacOS X El Capitan 10.11.6, and macOS Sierra 10.12 is entirely removed from the Mac as the restore process effectively rolled back the Mac to before Sierra was installed. In case it wasn’t obvious, that is why Time Machine is called Time Machine, by the way, since it effectively lets a user step their OS and files back in time if need be. Interim Files: Once the downgrade has complete and you’re back to El Capitan, Mavericks, etc, you’ll likely want to manually copy back over any of the interim files you saved from Sierra. If you skip this, you’ll simply be missing documents from the period of time where the El Capitan/Mavericks backup was made and when you installed Sierra. 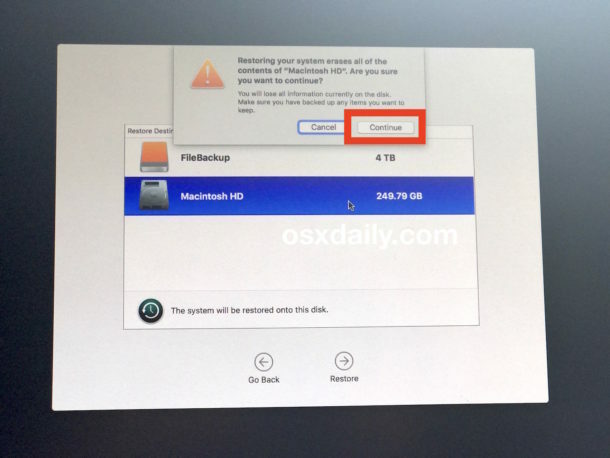 Re-Arming FileVault: If you used FileVault encryption, you had to disable it in order to restore from the Time Machine backup. FileVault will stay disabled after the restore is complete. This means you will need to enable FileVault on the Mac again after the downgrade has completed. Just do this through the System Preferences > Security control panel, and remember it requires a minor setup process and reboot as the drive encrypts itself. Avoiding Potential Trouble with Safari 10 / WebKit? : If you are downgrading from macOS Sierra for troubleshooting purposes, specifically due to kernel errors, a billion com.apple.WebKit files open, or other persistent Safari and/or WebKit difficulty, you will likely want to avoid the Safari 10 update that will be available in the Mac App Store of El Capitan. If there is any bug with Safari 10 it will undoubtedly be fixed in a future software update, perhaps as Safari 10.0.1 or similar. To be clear, this is largely speculation based on personal extensive experience troubleshooting a highly problematic macOS Sierra setup, but a similar kernel file table is full issue has also been encountered by some users with El Capitan and Safari 10, suggesting a possible relationship. What about MacOS Sierra 10.12.1? 10.12.2? 10.12.3, 10.12.x? 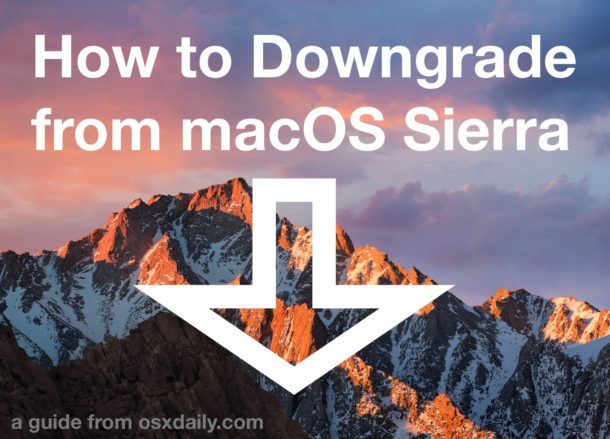 For users who downgrade from the initial Sierra release for troubleshooting purposes, you’ll likely want to stay on the newly restored and stable release of Mac OS or Mac OS X for a while. When future macOS Sierra updates and bug fixes are released, perhaps as 10.12.1, 10.12.2, 10.12.5, or 10.12.x, it may be time to update to Sierra again. Some Mac users also like to stay on a specific stable release that works for them if they have no need for new features, a valid approach as well. The vast majority of Mac users do not downgrade system software, and do not need to downgrade system software. With that said, for those individuals who choose to downgrade from a major system software release, they are typically doing so because of incompatibilities with required software, incompatibilities with third party apps or perhiphreals, or because of an overly problematic experience with the new OS release. For me personally, I downgraded a specific MacBook Pro from macOS Sierra back to El Capitan because, despite significant troubleshooting efforts, clean installs, and re-installations of macOS Sierra, I could not get the Mac to maintain any degree of stability whatsoever with Sierra, and ultimately rebooting twice a day in between constant app crashes and freezes proved overly burdensome for my particular environment. It’s important to point out this type of experience is rare, and not at all what most people experience. Is there a way to downgrade from macOS Sierra without Time Machine or without a backup? Yes, but there are major caveats. Most of the time, it will lead to data loss. If you happen to have a USB installer drive from El Capitan or a prior release that is compatible with the Mac, you could format the Mac and perform a clean install of that Mac OS release. This will erase everything on the computer, including all files, data, photos, music, anything and everything. Losing all data is not acceptable to most users unless they make manual backups,. 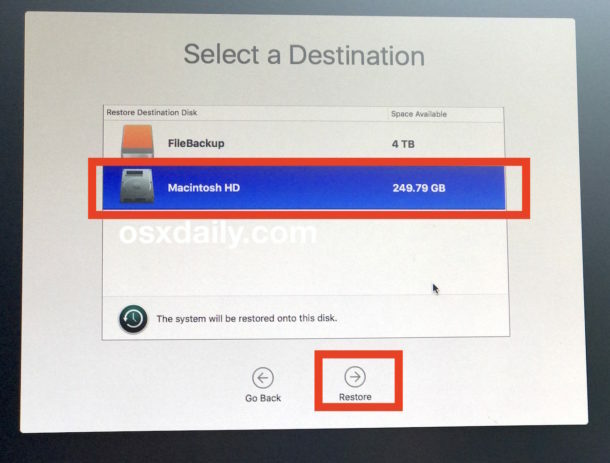 Another method that would also result in data loss is using Internet Restore to reinstall Mac OS X, which downloads and attempts to reinstall the original version of Mac OS X which shipped on the Mac. Neither of these other approaches are going to be covered in this specific article, but you can learn how to clean install El Capitan here or clean install Mavericks here if interested. Did you downgrade from macOS Sierra using Time Machine? How did it go? Do you have any other tips or advice about downgrading macOS? Let us know in the comments below. I had the same types of problems with a late 2009 iMac. Crashing apps, frozen finder, spinning beach balls. I re-installed Sierra then clean re-installed. No luck. Took it back to El Capitan. Despite a few little issues that seem to be worked out (minus one), I’m enjoying the update! Looking forward to Siri doing more or better searches. And prayerfully MacOS Sierra 10.12.1 will not produce issues like El Capitan’s .1 did for my mail, ugh!!! I wonder when will the time come when users will have enough of all such issues after each OS release and give up on Apple. I suspect when there is an alternative that doesn’t “have such issues after each OS release”. And that will be exactly,.. never. Apple is starting to seem more like Microsoft everyday. I thought I had left this kind of bleeding edge/leading edge situation behind when I gave up on Microsoft. For example, why can I no longer upgrade to El Capitan from Yosemite? At least that OS proved stable after a year’s worth of releases. It isn’t in the iStore anymore. If I had known that Apple cuts off prior working OS releases in order to force users into a new and untried operating system, I would have upgraded when I had the chance. Is there anything that can be done now to get El Capitan? El Capitan is not available to buy any more. Apple removed it from sale when Sierra was released; a perfectly reasonable business decision. Microsoft only sell Office 365 and 2016 on their website. Adobe only sell Creative Cloud. Maxon only sell R18. See the pattern? You can access 10.11 if you purchased it before Sierra came out. It will appear in your Purchases tab for download. There’s a big difference between an application (Office 365, Adobe Creative Cloud) and an operating system (El Capitan). There are alternatives to the application – Open Office, Pages, etc. so if you have a problem, you can switch. But if the OS goes bad, you are in BIG trouble. That’s why I prefer to stay a step or two behind. And it is possible to get earlier versions even of Windows 7 on the Microsoft site. The earlier versions may not be supported, but that’s OK if you’re happy with the functioning of the OS. As there are unofficial installers for Sierra (e.g. https://mega.nz/#%21vplHFAbL%210d1Ka0DHcGdD4rIohra9S85m8YDP2cIdtVLg1SxxKTk ) I suspect you could find one for El Capitan too without too much effort. Hi, I have the same problem. Would love to upgrade to El Capitan from Yosemite. Yosemite is slightly better than Sierra but El Capitan is the better of the three in my experience, if you’re looking for stability and performance that is. It’s going to get worse, Apple is going full Microsoft starting today and automatically downloading the macOS Sierra to Macs trying to force people to update. If MacOS Sierra was a good OS that was stable, that may not be a problem, but I had to downgrade and abandon Sierra after it turned my Mac into a useless $2500 paperweight. Fortunately I had an image to restore from, but I am very unimpressed with Sierra right now and will hold off until the second or third bug fix is out. Can’t risk having an nonfunctioning computer in my line of work. That is to be expected if you insist on being on the bleeding/leading edge. Or, you could wait a few months to upgrade (or skip it entirely if you wish) to let those aware of history find the problems and resolutions (if/when they are found). No one forced you to install the .0 release. I presume you did a full bootable backup you can restore, or created a bootable installer for your previous OS version. No? Darn. That’s a shame. Am I the only one who doesn’t have any problems whatsoever with OS X installations? Granted, I do clean installs each time in the interest of cleanliness, but my machines always run fine. No hiccups, no issues, no worries. Updates seem to work well for about 90% of people, the remaining 10% have problems. So you’re in the lucky group, consider yourself lucky. I had to spend a day restoring to El Capitan image after Sierra bricked my Mac. Not a fun time. I typically just do in-place upgrades, and iron out any issues I might encounter afterward. Picking a time that is low impact/less busy is important. My own upgrade to Sierra was largely uneventful problem wise. Found a driver update for my dock, found and issued a terminal command (no, not rm -rf everything! ;) to fix a “temporary” incompatibility with another add-on app. Otherwise not much else to speak of. Minor (very minor) problem with external display connected at boot time, which I expect will be resolved in a future update. No…..You’re not the only one. I never have any issues either with any of my machines and I’ve been updating since the days of OS7. I suspect those with issues are more likely to comment! You only ever hear about the problems. Those of us who are careful and subsequently trouble free don’t usually have to post in the forums. Apple pulled the option to download El Cap from the App store, the turkeys. It’s not even available on their site. You can re-download El Capitan from the “Purchases” tab of Mac App Store, assuming you already downloaded it some time ago anyway. Historically, this is how they’ve done it. Upgrade released, remove previous version. The previous versions can be found in the “purchases” section, presuming you downloaded it from the App Store to begin with. Before I upgraded to Yosemite I had never had any problems with Apple operating systems. A few weeks after upgrading I found my emails were sticking in the SMTP server (as seems to affect many users)! I reverted to Mavericks via a Time Machine backup after finding the correct backup and everything is working fine again! Not inclined to try another upgrade to latest OS for a while until no one is making any complaints about more bugs! Keep making backups is the answer! Indeed. You can’t restore, if you don’t have a backup. Typically, you want to do a full backup just before you install an OS upgrade. Work with the new OS version for several days. My mid 2010 mac was working perfectly on El Capitan and though the Sierra upgrade went without a hitch the increased demand of the new OS caused my fan to go on overload just browsing static web pages. Watching Netflix needed the volume high to get over the fan. The Time Machine downgrade worked a treat. Glad I didn’t listen to those sites who said it wasn’t possible without putting El Capitan on a disc and erasing Sierra booting from the disc and recovering from Time Machine. Just Time Machine is all you need. Patrick, I’m glad it worked well for you! As for the other sites out there, I can only speculate they have never actually performed a downgrade with Time Machine and thus don’t know how it works. But as you found, it works great, and it’s the easiest way to revert back from Sierra to El Capitan, Yosemite, or Mavericks. There is a far simpler solution than using Apple’s unreliable Time Machine, cloning using SuperDuper (my choice) or CarbonCopyCloner. Simply clone using one of these prior to upgrading, if you want to revert, boot to the clone (hold option when starting with clone drive connected) launch the clone application and clone the backup to your system drive. End of story. Also, a clone is directly accessible if you need to restore a single file or folder, no application required as there is with Time Machine. Will I have to reinstall or reactivate any of my applications if I use a Time Machine restore? The only reason I want to downgrade is neither my Roland nor Tascam drivers are compatible with Sierra and not sure when/if they’ll be updated. Everything else works great. Thanks! Followed these instructions for a mid-2011 iMac – very easy to do and worked without a hitch. Only thing I forgot was to manually make a copy of the emails I’d received since the date of the Time Machine backup I chose to restore from. But it was only a handful, so no problem. Please help! I would like to go back to El Capitan, but don’t have a recent time machine backup. Are there any other options? I just did it today and my quickbooks will not work. Can I just take Sierra off and go back??? Wanted to dial back from Sierra (for several reasons) and go back to the Yosemite release that worked quite well on my MacBook Pro. Created a bootable USB stick with Yosemite installer and, apart from the initial setup dialog that gave me a few issues, the downgrade went well. Now, I’m reinstalling my content that I’d backed up beforehand. Only issue so far is that the mail importer doesn’t seem to recognize the mailboxes I’d backed up — anyone know if Sierra upgraded Mail mailboxes so they’re not readable by Yosemite? Anyone know how to get around that? Dear OSXDaily. YOur instructions for rolling back my ill advised update to MacOS Sierra have works perfectly. FOr 5 days I have tried dozens of fixes found on line…how to get past password security with a black screen is a new skill. MY Mac mini couldn’t find any external attachment except the 3 TB WD drive. Apple wired cd/DVD couldn’t play, load music or eject. COuldn’t see Sandisk SD cards or thumb drives. SAfari worked but slowly…running is safe mode (only way to get screen to light). OK Apple….this is happening on Jan,20 2017. IT is obvious that these severe problems have been documented for nearly 6 months. And I loaded Sierra from the Ap Store. Apple is shoving bad code out, dudes. Apple wrecked my machine! It’s only because there are nice skilled independents like these folk that I can go to bed tonight with a functioning computer in my office. Tried to go back from Sierra with my Time Machine” Everything seemed to go well, but when my computer rebooted after the download all I got was a blank screen. Can anyone tell me what happened? What can I do to get my computer up and working again?? For over four weeks I have not had access to the programs that I use daily. Unfortunately Dumb a** me up-graded to OS X High Sierra and was prompted after that to up-grade it several times again. What I didn’t understand that my programs do not run on that operating system and I would need to pay monthly fees to go to the cloud. At my much senior age and fewer projects that come along, this is not ideal. I have taken my Mac into the apple store and spoke with the apple help line several times now and no one have solved my problem… can someone offer me any advise.